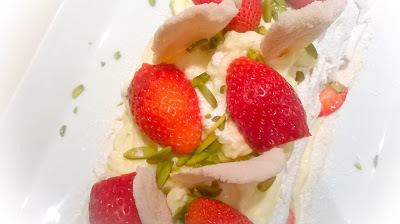 Rose, strawberry and pistachio...Give me this combination of flavours any day! 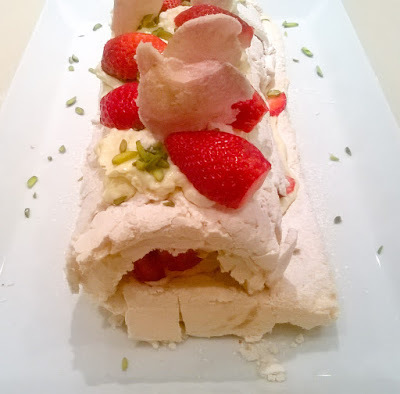 This meringue roulade is divine...A delicate meringue filled with a rose flavoured mascarpone creme and luscious strawberries, its pleasing to the eye and the palate. Just thinking about it makes me drool...This dessert is sure to make everyone ooh and aah! I really love this and I'm sure you will too! Go on...give it a try. Happy Baking! 1. Preheat an oven to 160C/140C fan/Gas Mark 3. 2. Line a 33cm x 24cm swiss roll tin with greaseproof paper, allowing it to overlap above the sides of the tin. 3. Whisk the egg whites with an electric mixer until they begin to firm up. Add the caster sugar a spoonful at a time, whilst whisking. Continue whisking until you achieve a firm, glossy meringue. Gently fold in the vanilla, vinegar and cornflour. Spread the meringue into the prepared tin and level with a palette knife. Bake for 30 minutes (be careful not to overbake, it should still be soft). Allow the meringue to cool in the tin. 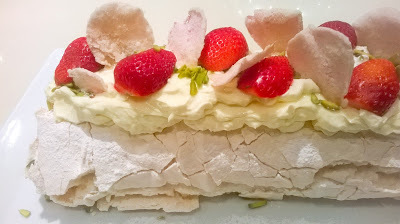 4. invert the cooled meringue onto a fresh piece of baking paper and carefully peel off the lining paper. 5. For the mascarpone filling, place the mascarpone cheese in a mixing bowl with the rose water and icing sugar and whisk to combine. Add the whipping cream. 6. Whisk until the cream just holds its shape. Spread most of the cream over the meringue, reserving a few tablespoons. Scatter over most of the strawberries.Using the paper to assist you, roll up the meringue along its long edge. Transfer the log onto a serving plate. Top the meringue with the remaining cream. Chill for at least 30 minutes. 7. 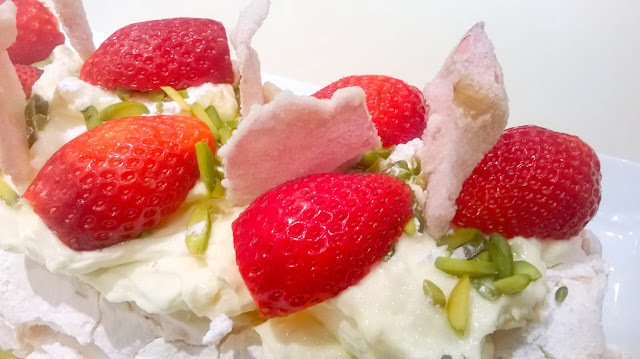 To serve, dust with icing sugar, scatter with the remaining strawberries, the pistachios and the rose petals. NB: The recipe is adapted from Plenty More by Yotam Ottolenghi (have I mentioned how fab this book is?). The original recipe uses raspberries instead of strawberries, which are just as delicious. I've also replaced the dried rose petals from the original recipe to crystallised petals which are really simple to make. I'll try to post a 'how to' soon, but it is basically rose petals brushed with a little bit of egg white and dipped in superfine/caster sugar.